And finally another finished object. 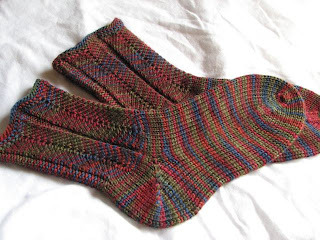 I have an aunt who lives in Ketchikan, Alaska and she recently requested a pair of handknit socks. Since she is outdoors a lot, we agreed that a heavier weight "boot sock" would be suitable. Luckily for me, I had a skein of Lorna's Laces Shepherd Worsted (colorway: Tuscany) waiting patiently in my stash - so out it came and these socks were born. 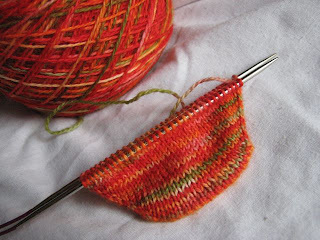 The pattern is the Chevron Stitch from Sensational Knitted Socks, worked with a short-row heel and a stockinette foot. I worked it over 52 sts on a US sz 4 needle, magic loop. Great stitch pattern, but you do have to be careful with the sizing as it doesn't have a lot of give. This is for you. For all the times you have made me lust after your yarn. Look!! Look at all that greyish, bluish, purpley deliciousness! Miiiiine.....allllllll miiiiiine....muwahahahaha. Heck, for all I know, you already have this yarn. Here's hoping I made you do a double-take, at least. P.S. 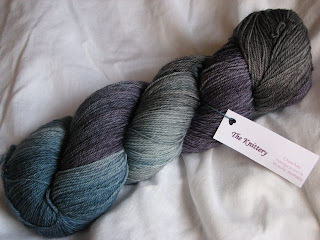 This colorway is called Moonlight, but it looks like it's not available at The Loopy Ewe at the moment. 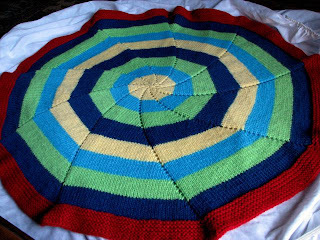 I finished the Pinwheel Blanket, but haven't washed or blocked it yet, so you'll have to wait for those pictures. 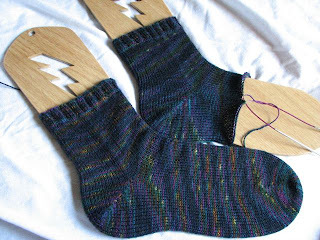 I'm also nearly ready for the toe of the first Soxie sock, but again, no progress picture. 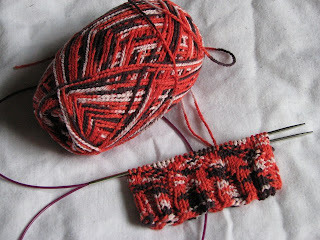 However, I've started a new sock! 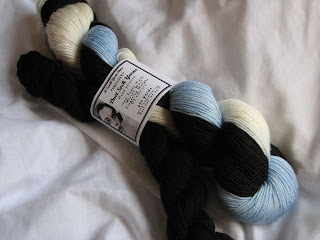 This is the yarn I received in the Dye-O-Rama swap several months ago. It was dyed with KoolAid and I really love the colors and how it is knitting up. P.S. We put our house on the market this week!! Squee!!! I got my Sockapalooza package this week! Thank you, Emily! The sock yarn is alpaca/silk and sooo soft and slinky and the socks fit perfectly. The other little goodies are fun, too! This has been a crazy week. My parents came to visit last weekend and ended up taking my kids home with them for the week so we can do the final push to get the house ready to put on the market. It has been incredibly helpful to be kid-free this week and we've gotten so much done. A few things left to go, though! The realtor comes Monday to do the appraisal and then we'll be ready to list the house. As a result of all the house stuff, I've had precious little time to knit. 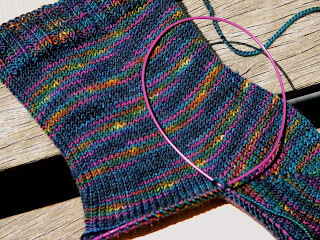 However, I did start a plain stockinette sock and turned the heel last night. This yarn is so hard to photograph - this picture shows the colors well, but overall the actual sock is several shades darker than this. The Charade socks, in Lorna's Laces "Black Watch." 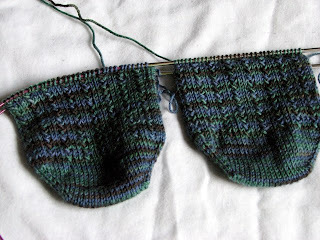 I really like the pattern, but knitting two socks at once goes sooo slowly for me. 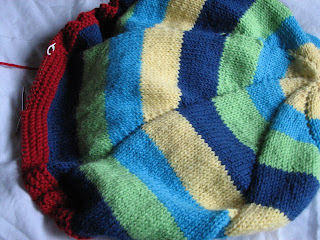 The Pinwheel Blanket, knit in leftover Plymouth Encore from my stash (except for the red, which I had to purchase). 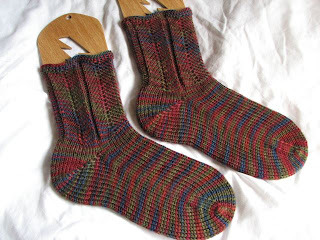 The RPM socks, knit in Crystal Palace's new Maizy sock yarn in the "News!" colorway.